Why can’t we just have all the answers? 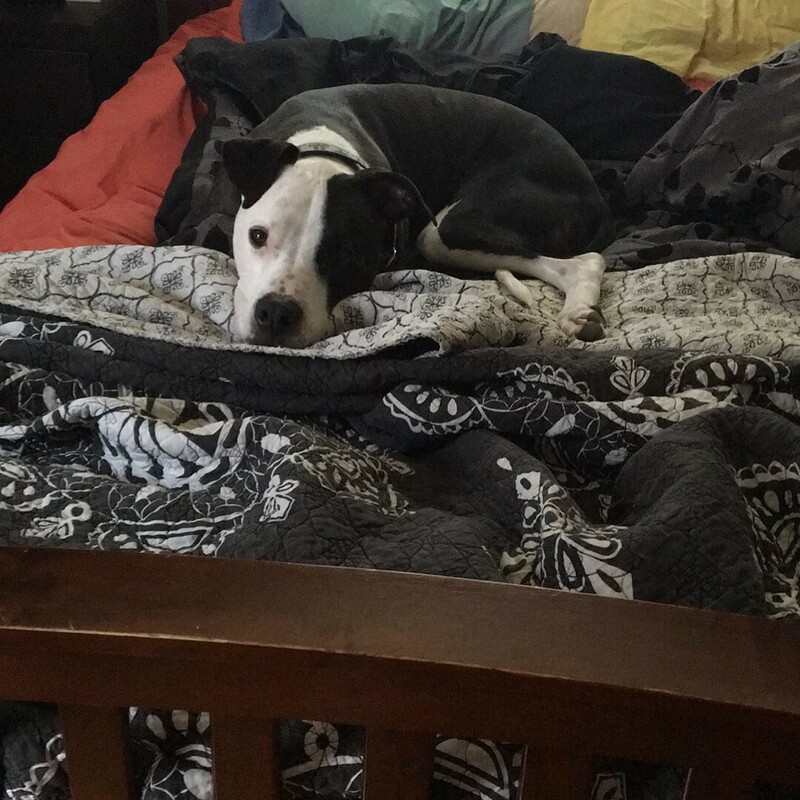 One of my co-workers made the heart-wrenching decision to euthanize one of her two dogs a couple weeks ago. Maddie passed, a life long-lived and well-spent, surrounded by her family. As a Christian, I find myself in direct conflict with who I am as a dog mom and an animal lover and animal rights activist in instances such as these. Because if you asked me where Maddie is today, I could not confidently tell you. 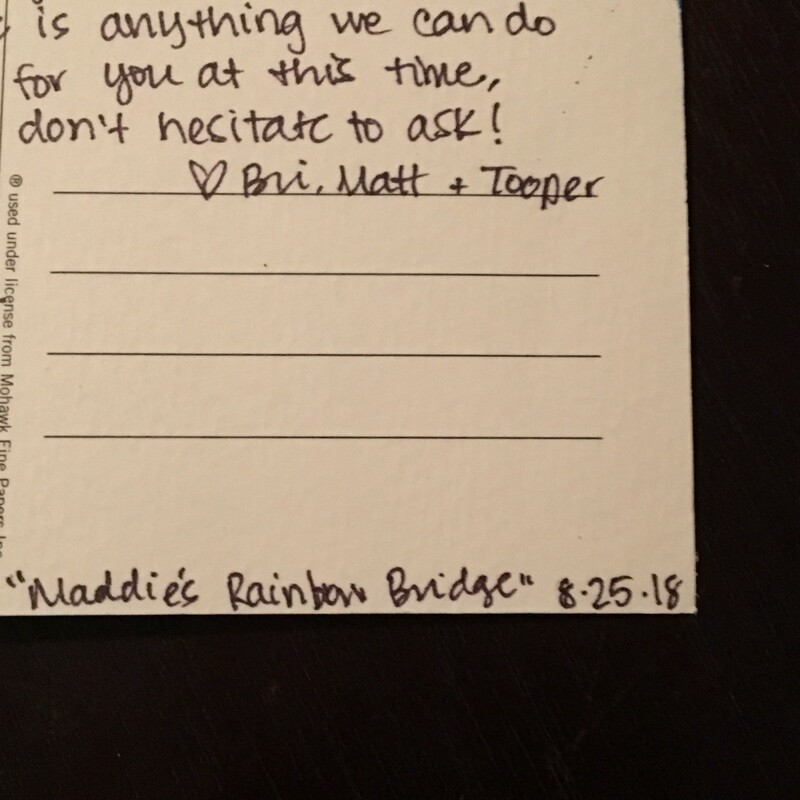 Oh, that “dreaded” Rainbow Bridge poem. That think-piece penned by Unknown in the 1980s. I am perpetually on social media, and as a member of the animal rescue community I don’t even need context to know why someone is invoking The Rainbow Bridge, whether as a link or a direct copy/paste into a Facebook comment. Inevitably, someone’s beloved pet died; it’s an apolitical, areligious way of explaining what happens to our pets when they die. It’s supposed to give a grieving pet owner comfort and hope. But — the orthodox in me screams — The Rainbow Bridge is not biblical! It’s not rooted in Scripture! I’m probably not supposed to believe in The Rainbow Bridge. And I try not to. But, I’m not gonna lie…I can see why it helps. Last week, Matt and I had a bit of a scare with our resident beast. We went back and forth to the vet with Tooper over what was initially suspected to be an intestinal blockage. $600 of procedures and exams later, we suspect it was canine novovirus (a.k.a. doggy stomach flu). But in those moments last week, especially with Maddie’s death on my mind, it seems like all I could really think about was losing Tooper. It seems silly, but every breath was a prayer that he would get better without spending all the money we had. And what if this was his time to pass? Surely I would not be ready for that. Especially if Earth is the last place I will see him. Sometimes it’s just easier to not think about it and hope that something like a rainbow bridge exists. I don’t know if dogs go to heaven. At least not in the way humans who believe in Christ and are baptized are saved. What I do know is that Christ is coming again, with Him a new heaven and a new earth, a creation fully restored. I imagine that includes dogs, cats, ferrets, snakes, Komodo dragons…all manner of animals, exotic and domestic. And all created good. Do I know that I’ll see Tooper on that day of a restored creation? I don’t. But I have faith that the restoration that Christ brings is better than anything I’ve known or experienced — and it is enough for me to know that Tooper will be living his best life on Earth until his time here ends. 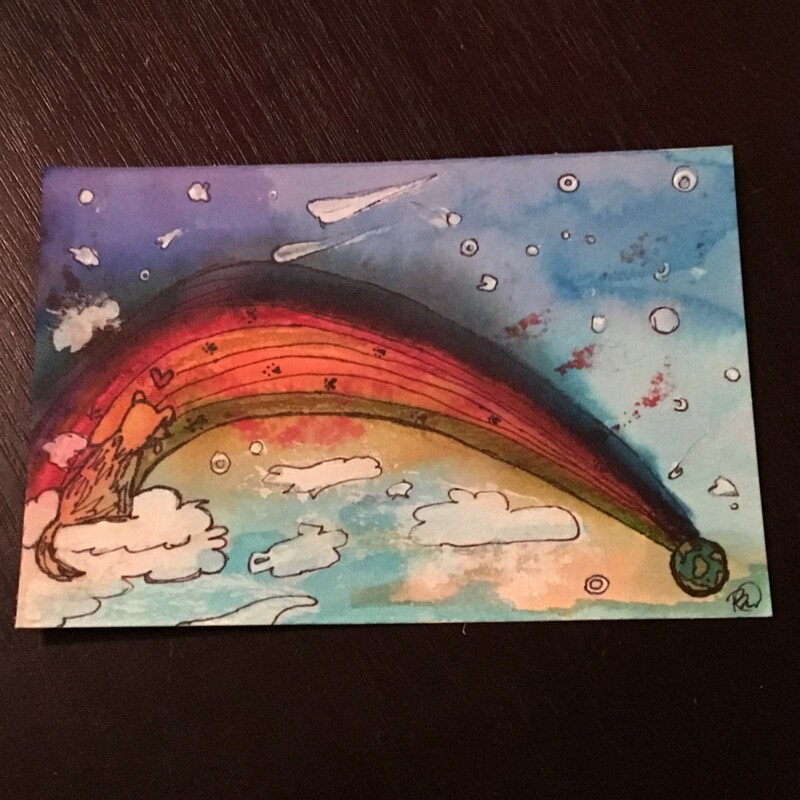 I truthfully was reticent to use rainbow bridge imagery in this painting, but I knew I wanted to do something for her to show my support and solidarity as a fellow dog-mom in a time of grief. As I reflect on this project, I’m realizing that the imagery being used here is not what is significant. What is significant is the reminder that God places people in our lives to minister to us, comfort us, help us and support us. What is significant is that God uses these times of grief and mourning to exhibit His faithfulness through His people. I pray that this gesture can serve as a sweet memorial to Maddie, and a reminder that God can use something as unexpected as artistry to be His witness.